I mentioned that the containers aren’t arranged in a way I prefer (low carb), but they are still relatively balanced and a great guide for someone unfamiliar with healthy eating. If you aren’t used to meal planning and eating a balanced diet, then this program would be pretty great for you. The booklet tells you everything you need to eat in each container. It comes with some recipes. There are loads of recipes and tips online too. For a crash course in healthy eating or just a way to eat more veggies, this plan is pretty awesome! With crazy restaurant portions, most people have a skewed sense of what a serving of food looks like. By measuring out your food, you start to learn what a proper portion is and what amount of food will fill you up without being stuffed. Also, sometimes figuring out the relative proportion of protein to vegetable to carb can be confusing. The perfectly sized containers takes out the guess work for you! So far, there is a nice variety in the workouts. I have done Focus T25, Body Beast, and Insanity in the past. Those programs were very consistent from day to day, almost feeling like I was doing the same workout with small variations. So far, each of the 21DFE DVDs have been great yet each had their own style. The Pilates workout was nothing like Plyo which was nothing like yoga. It is great to have a big of variety, especially when you are using it every day! If you are like me and sometimes can’t decide what workout you want to do that day, it is nice to just have a schedule and follow it. Everything is planned out for 3 weeks and you can just continue to repeat the program as long as you like. There are no rest days but Yoga is a nice break from the harder workouts the rest of the week. You can maintain this schedule for a long time, and by upping your weights after a few weeks, your body will continue to adapt and grow stronger! If you really enjoy fixed timeline challenges, then this isn’t a bad option. It can be a great way to break through a weight loss plateau, get ready for an approaching event (vacation, wedding), or just change things up for a while. Many of the Beach Body programs are upwards of 90 days so 21 days is a piece of cake! There are elements of the 21 Day Fix Extreme that I enjoy but there are some limitations that just don’t work for me. I can definitely continue to use the containers to get enough vegetables and protein but adjust it to work better for my macronutrient preferences. The workouts aren’t so terrible either and I can see myself doing them pretty regularly, even while triathlon training. What tricks do you use to make healthy eating easier? 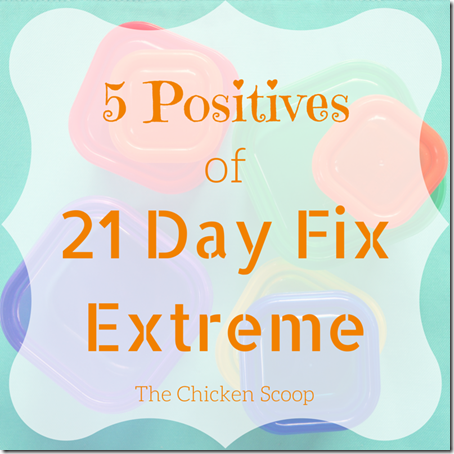 Check out my 5 Struggles With 21 Day Fix Extreme!